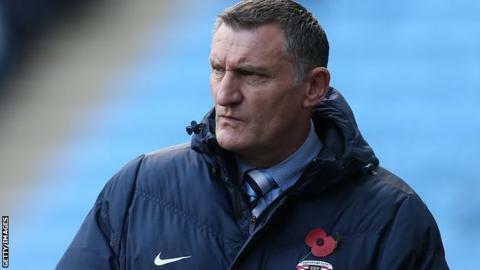 Coventry City manager Tony Mowbray admits the League One club are struggling to find a replacement for influential defender Reda Johnson. Johnson, 27, was ruled out for the rest of the season after damaging his hamstring against Blackpool last month. "Reda Johnson is a huge miss for this football club," Mowbray told BBC Coventry & Warwickshire. "We're finding it pretty tough to find the right player to come in and fill that gap." Despite Johnson's absence, the Sky Blues have maintained their push for promotion with two draws and two wins in their last four league games. But City suffered disappointment in the FA Cup as former landlords Northampton Town inflicted Coventry's first defeat at the Rocoh Arena this season, winning their first-round tie 2-1. And Mowbray says if Johnson was still fit, results may well have been better. "I don't think some of the goals we've conceded would've gone in with a dominant central defender in the middle of our defence," he said. "The search goes on to try to find someone and bring in some defensive help."